Written, directed, edited, co-art directed, and starring Rainer Werner Fassbinder, Liebe ist kalter als der Tod (Love is Colder than Death) is the story of a pimp who is in a love triangle with one of his prostitutes and a fellow gangster as they plan a robbery. The film is an unconventional crime drama that explore a man trying to make his own mark in the world of crime while being in the middle of a love triangle as well as try to evade other crime syndicates and such. Also starring Hanna Schygulla and Ulli Lommel. 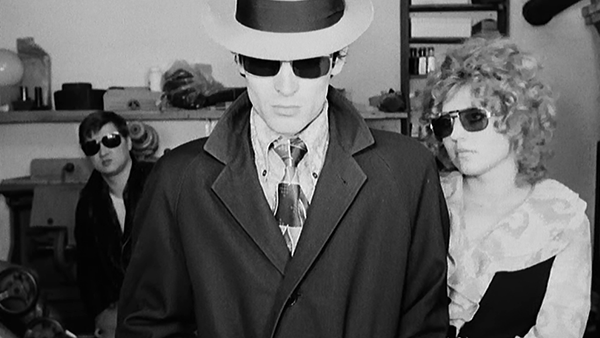 Liebe ist kalter als der Tod is an intriguing yet offbeat film from Rainer Werner Fassbinder. The film is a simple story in the world of crime as a gangster goes to Munich to meet up with a pimp, he had met some time earlier at an interview for a crime syndicate, as they plan a robbery with the pimp’s prostitute girlfriend. It’s a film that explores two guys and a woman who all embark into a love triangle as well as try to make it in their own amidst the watch of figures from a crime syndicate as well as the authorities. Rainer Werner Fassbinder’s screenplay is quite minimalist as it is more about characters meeting each other and planning as well as moments where they wander around their surroundings as much of the film is set in Munich. The visiting gangster Bruno (Ulli Lommel) is someone, like the pimp Franz (Rainer Werner Fassbinder), both have been watched by this mysterious syndicate yet want to make their own marks. Helping them is Franz’s girlfriend Joanna (Hanna Schygulla) who isn’t fond of Bruno at first but realizes his value once Franz is suspected of killing a known gangster as she would spend some time with him. Fassbinder’s direction also play into the simplistic tone of the story as he doesn’t really go for anything that is overly-stylized in terms of compositions. There aren’t a lot of close-ups nor wide shots in the film as it’s more about medium shots to capture the relationship between Bruno, Franz, and Joanna. Shot largely in Munich and areas near the city, Fassbinder would use some tracking shots for some of the exteriors in the city as well as a few movements in some of the interiors. Yet, much of Fassbinder’s direction involve him using the medium shots to create scenes in long takes to maintain some kind of theatricality in the acting. Also serving as the film’s editor under a pseudonym, Fassbinder does put in some jump-cuts in a few sequences as much of it is straightforward. Especially in some of the moments of violence where it does have element of style as it is a bit playful but also dark. Overall, Fassbinder creates an engaging yet exciting film about a gangster, a pimp, and a prostitute trying to start a robbery while being in a love triangle. Cinematographer Dietrich Lohmann does excellent work with the film’s black-and-white cinematography as it has a grainy yet beautiful look in the way the daytime exterior scenes are shown as well as some of the interiors including some scenes at the department stores. Co-art director Ulli Lommel, along with Fassbinder, would do fantastic work in creating the sets such as the meeting room for the first scene as well as the apartment that Bruno and Joanna lived in. The sound work of Gottfried Hungsberg is terrific for the sound as it is mostly straightforward as well as low-key given to the film’s low-budget aesthetics. The film’s music by Peer Raben and Holger Munzer is superb for its mixture of blues, jazz, and rock to help create a chilling score with additional music presented from whatever is on the jukebox or on the radio. The film’s brilliant cast feature some notable small roles from Peter Moland as an interrogator for the secret crime syndicate, Hannes Gromball as a client of Joanna who would come in at the wrong time, Irm Herrmann as a saleslady being conned by the trio, Peter Berling as a shoemaker who sells weapons, Monika Stadler as a waitress watching Bruno kill someone, and Katrin Schaake as a woman Bruno meets on a train on his way to Munich. Rainer Werner Fassbinder is excellent as Franz as a pimp that is trying to run his own business without the involvement of this syndicate as he copes with his relationship with Joanna and feelings for Bruno. Hanna Schygulla is amazing as Joanna as a prostitute who is also Franz’s girlfriend that is coping with the planning as well as the presence of Bruno whom she isn’t fond of at first. Finally, there’s Ulli Lommel in a marvelous performance as Bruno as a gangster that is also trying to make it on his own as he wants to create a partnership with Franz while becoming infatuated with Joanna as well as be very cunning in handling business. Liebe ist kalter als der Tod is a remarkable film from Rainer Werner Fassbinder. Featuring a great cast as well as a compelling script, it’s a film that doesn’t play by the rules while not being afraid to give in toward it low-budget aesthetics. In the end, Liebe ist kalter als der Tod is a marvelous film from Rainer Werner Fassbinder. Okay now you're making me feel lazy. I haven't seen this and look at all these excellent reasons why I totally need to. It was on TCM some months ago as I knew I needed to see this as they don't show films by Fassbinder very often. It's a really good debut film by someone who would be an important figure in cinema.